Following the irrevocable Presidential payment notice to Central bank of Nigeria to release all outstanding contract /Inheritance / ATM CARDPayments claims in this First Quarter of the year 2018 as a new payment Resolution policy. Subject: DEAR ,WHY DID YOU ABANDON YOUR $15.5m,us,?URGENT,FROM,DR.SALIM MOHAMOD SHAFIE. FROM THE DESK OF DR.SALIM MOHAMOD SHAFIE.DIRECTOR,COMPUTER AND MONITORING UNIT,CENTRAL BANK OF NIGERIA,(CBN). Following the irrevocable Presidential payment notice to Central bank of Nigeria to release all outstanding Inheritance claims in this Third Quarter of the year 2018 as a new payment Resolution policy. After our close door meeting with all concerned Ministries, local banks and financial Authorities involved in the payments of over due Inheritancepayments . We discovered that your file was dumped because some Sacked Bank officials were trying to divert your payment to their private bank Account unofficially without success, That was why i was instructed by the Hon. 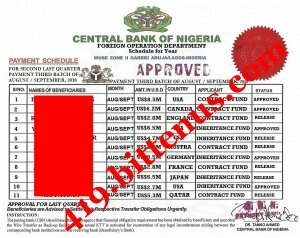 Minister of Finance and the Federal Government of Nigeria to contact you for paymentupdate Via bank to bank wire transfer. Meanwhile the transfer arrangements on your Fund was perfected after agreement with the Hon,Minister of Finance Mrs .Zainab Ahmed, Who presented the new bank account normalization letter from Minister of Justice authorizing me to release your approved funds into your accounts immediately. Now your new Payment Reference No.35467721, Allocation No: 67487632 Password No: 33988331, Pin Code No: 55674 and your Certificate of Merit Payment No: 103, Released Code No: 0763; Immediate Telex confirmation No:-111411433; Secret Code No: XXTN04413. Having received these vital payment information numbers, therefore you are now qualified to receive your funds within 48hrs. The telex report and transfer slips will be forwarded to you accordingly by then the fund will reflect in your account immediately without any waste of time as you will also confirm this in your Bank Account. The transfer would be done ASAP, So we are advising you to Send the Sum of $ 150.00 being the PRESIDENTIAL OFFICIAL CREDITING FEES FOR THE TRANSFER of your fund. Send the $ 150.00 through the secretary to the Hon, Minister of finance , Mrs. Zainab Ahmed, to enable us perfect the transfer. RECEIVER ' S NAME ; JOHN IKE. AMOUNT $ 150.00 ( One Hundred And Fifty United States Dollars ). I will call your bank as soon as I hear from you before making thetransfer. NAME OF YOUR ACCOUNTANT/ MANAGER. Subject: DEAR BENEFICIARY,WHY DID YOU ABANDON YOUR $15.5m,us,?URGENT,FROM,DR.SALIM MOHAMOD SHAFIE. FROM THE DESK OF DR.SALIM MOHAMOD SHAFIE. DIRECTOR,COMPUTER AND MONITORING UNIT,CENTRAL BANK OF NIGERIA,(CBN). The transfer would be done ASAP, So we are advising you to Send the Sum of $150.00 being the PRESIDENTIAL OFFICIAL CREDITING FEES FOR THE TRANSFER of your fund. Send the $150.00 through the secretary to the Hon, Minister of finance , Mrs. Zainab Ahmed, to enable us perfect the transfer. RECEIVER'S NAME ; JOHN IKE. AMOUNT $150.00 ( One Hundred And Fifty United States Dollars ). I will call your bank as soon as I hear from you before making the transfer. PLEASE RECONFIRM YOUR BANKING DETAILS TO AVOID WRONG PAYMENTINCLUDING PHONE, FAX NUMBERS AND YOUR ID AND ALSO THENAME OF YOUR ACCOUNTANT/ MANAGER. I am sorry getting back to you late after your reply to my mail dated Nov 8, 2018. I have been very busy with a lot of administrative issues and only officially hard time now to attend to your mail. Thank You for reconfirming your details and also indicating your choice to receive your fund paid to you through ATM master card. This office has started without further delay the processing of your payment which will be effected through payment by ATM Master Card. We have already programmed your fund, loaded in an ATM card that will be delivered to you at your designated address with us. Please do let us know as soon as you receive the card. Most importantly, note this ministry will not be responsible for the payment of the delivery of the card to you as instructed by the Federal Government. I am in receipt of your mail, thanks. My office is administratively doing everything possible to ensure your ATM Card is sent out this week after due administrative documentation. Note, like I did inform you in my previous mail, that on the directive of the government here, the beneficiary of the card is responsible to pay for the delivery fee on the card to beneficiaries designated address or in alternative the beneficiary should come down in person and receive the card by hand. Attached is Central Bank beneficiary list where your name appears among the names of beneficiaries to be paid. For record purpose, keep this document safely. To ensure there is error in your address I will be glad you reconfirm your mail receiving address once again.